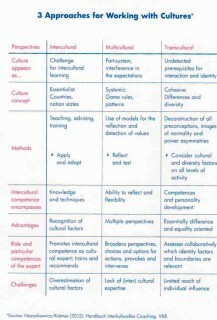 A very good schema for orientation if addressing different cultures or working with them. This is related to cultures, firms, organisations and other Systems. Be aware of this, prepare yourself in this sense, build up your concepts and don`t miss this as a theoretical and practical orientation. Nazarkiewicz and Krämer are convinced that cultural competence is based on a certain, specific cultural sensitivity, a cultural approach, a personal and / or cultural habit to experience and specific concepts which support practical interaction as well as communication. Let me pick up again just one main issue. Related to the three above mentioned approaches one can take a look at the specific situation one is in, in order to find out and decide about the special relevance of one of these three approaches. Studying the scheme which I post here in English can give you the idea of the important differentiation of intercultural approach, multicultural approach and transcultural approach. This understanding is connected with so to say the basic knowledge and recognition of cultural identity, cultural significance and cultural meaning. The multicultural approach helps to differentiate different, multiple perspectives within one culture or between two cultures or among a group of cultures. The transcultural approach, and to talk about this approach is new in this book, helps to experience the essential difference and equality in one’s own orientation towards one’s own culture and another culture. So to say one can experience the personal echo which is felt, which can be reflected and which motivates commitment and involvement in intercultural communication and relationship. Especially this echo facilitates the cultural approach and communication or on the other hand, if neglected, makes it more difficult. To bring it to a point you can say, that intercultural approach helps to learn the grammar and the vocabulary of a culture. The multicultural approach helps to get familiar with different so to say models of culture and cultural effects, where as the transcultural approach offers the chance to learn to talk, to communicate in the culture towards /with the culture always backed up by the well reflected and incorporated own personal, cultural habit.